Assassin's Creed Odyssey places more emphasis on role-playing elements than previous games in the series. The game contains dialogue options, branching quests and multiple endings. The player is able to choose the gender of the main character, adopting the role of Alexios or Kassandra. The game features a notoriety system in which mercenaries chase after the player if they commit crimes like killing or stealing. The player character, Alexios or Kassandra, is a mercenary, and a descendant of the Spartan king Leonidas I. They inherit his broken spear, which is forged into a blade to become a weapon that grants the player special abilities in combat. The game uses a skill tree system that allows the player to unlock new abilities. The three skill trees are "hunter", which focuses on ranged attacks through use of a bow & arrow, "warrior", which focuses on weapons based combat (swords, spears, axes etc. ), and "assassin", which focuses on stealth & silent take-downs. This replaces the system used in Origins, which granted the player a series of passive abilities. The hitbox combat system introduced in Origins returns and is expanded upon to grant the player access to different special skills when the ability bar fills up. These skills include calling a rain of arrows and a powerful kick to knock opponents off-balance, and are similar to the "Overpower" mechanic introduced in Origins that let the player use a powerful finishing move in combat. The game also features a gear system in which each piece of armor the player wears has different statistics and provides a range of advantages. These can be equipped and upgraded individually. Assassin's Creed Odyssey also features naval combat again, with the player having access to Hellenistic-era warships to explore the Aegean Sea. The conflict between Athens and Sparta is represented through a "War System" which enables players to take contracts from mercenaries and participate in different large-scale battles against hostile factions. The war system can change a faction's influence over a region. The player can develop romantic relationships with non-playable characters of both genders, regardless of their own character's gender. Creative director Jonathan Dumont commented that "since the story is choice-driven, we never force players in romantic situations they might not be comfortable with (...) I think this allows everybody to build the relationships they want, which I feel respects everybody’s roleplay style and desires." Players and critics appreciated this inclusion of queer romance options. However, many reacted negatively to a plot development in the Legacy of the First Blade DLC in which the player character has no choice but to enter into a relationship and have a child with a person of the opposite gender, considering that this invalidated their character's identity and the roleplaying aspects previously emphasized by Ubisoft. Ubisoft responded that "we strive to give players choice whenever possible in Odyssey and apologise to those surprised by the events in this episode". Ubisoft later stated that the forced romance would be removed with a future patch along with a modified cutscene. However this consisted of editing the cutscene slightly so that the player could tell their child they were only doing it for the blood-line - the child is still compulsory. The game is set in 431 BC, four hundred years before the events of Assassin's Creed Origins. It recounts the secret fictional history of the Peloponnesian War, which was fought between the city-states of Greece. The player takes on the role of a mercenary and is able to fight for the Delian League, led by Athens, or the Peloponnesian League, led by Sparta. The game's main storyline has the player character attempting to restore their fractured family after they and their sibling were thrown off a cliff in their youth and left for dead by their father by command of the Spartan oracle. Parallel quest lines deal with the extirpation of a malign cult spanning the Greek world, and the discovery of artifacts and monsters from Atlantean times. As with previous games in the series, Odyssey features a narrative set in the modern day and follows Layla Hassan, who was introduced in Assassin's Creed Origins. The game features a number of historical personages players can encounter and talk to, including Alkibiades, Archidamus II, Aristophanes, Aspasia, Brasidas, Euripides, Kleon, Democritus, Herodotos, Hippokrates, Pausanias, Perikles, Phidias, Polykleitos, Praxilla, Pythagoras, Sokrates, Sophokles and Thespis. It also includes historical and mythical Greek locations such as the Agora of Athens, Kephallonia, Ithaca, the Odeon of Athens, the Foloi oak forest, the statue of Zeus at Olympia, Naxos, Lesbos, ancient Athens, ancient Argolis, Pnyx, Phokis, Macedonia and Mesara. as well as takes on famous creatures from the Greek myths such as Medusa, the Cyclops and the Minotaur. During the Battle of Thermopylae, King Leonidas leads the Spartan army against a Persian charge. The battle is won, but Leonidas is informed by a captured enemy soldier that the existence of the mountain path has been revealed to the Persian army, which is moving to surround the Spartans by morning. Nevertheless, Leonidas resolves to hold off the Persian advance. In the present, Layla Hassan recovers the Spear of Leonidas and together with Victoria Bibeau, extracts the DNA of two individuals from it, the siblings Kassandra and Alexios. With help from the Assassins, Layla picks one of the siblings (the "Misthios") and activates the Animus to find the location of the Staff of Hermes. The Misthios started as a young Spartan child, raised by their parents Nikolaos and Myrrine, and inherited the Spear of Leonidas from Myrrine as one of Leonidas' descendants. However, one day, both the Misthios and their sibling are thrown off a mountain due to an oracle's prophecy, with the Misthios being dropped by Nikolaos himself. The Misthios survived the fall and fled to the island of Kephallonia, where they grew up performing odd jobs until the Peloponnesian War begins. The Misthios is approached by a wealthy man named Elpenor, who hires them to assassinate "The Wolf of Sparta". The Misthios later discovers that the Wolf is Nikolaos himself and confronts him. Nikolaos admits that he regrets what he had done, but did so for the good of Sparta. The Misthios has the choice of executing or sparing Nikolaos, and finds out that Nikolaos is actually their stepfather and that Myrrine is in danger. The Misthios confronts Elpenor, who reveals he knew Nikolaos was their stepfather and wanted him dead in order to drag out the war. He then offers another job to assassinate Myrrine, but the Misthios refuses and Elpenor flees. The Misthios then travels to Delphi to ask the Pythia the whereabouts of Myrrine, where they encounter Herodotos, who recognizes the Spear of Leonidas the Misthios carries. Upon meeting the Pythia, the Misthios is warned about the Cult of Kosmos, who seek to kill them and their family. The Misthios further investigates the Cult by assassinating Elpenor and using his disguise to infiltrate a Cult meeting. They find that the Cult plans to take advantage of the war to seize control of all of Greece, and that their enforcer Deimos is in fact the Misthios' sibling, now brainwashed to follow the Cult's orders. The Misthios continues on their journey all over Greece, clearing out Cult corruption from both Sparta and Athens and befriending powerful Greek figures such as Perikles and Aspasia. They are unable to stop Perikles' assassination at the hands of Deimos, but are able to reunite with Myrrine and find their true father, Pythagoras. Myrrine and Pythagoras explain that they conceived Alexios and Kassandra to preserve Leonidas' bloodline, as he and his descendants have a special connection to Precursor artifacts, such as the Spear of Leonidas. Pythagoras tasks the Misthios to recover several Precursor artifacts needed to permanently seal the hidden Precursor city of Atlantis so that its knowledge cannot be misused by enemies like the Cult. Afterwards, the Misthios manages to avenge Perikles' death by assassinating his political rival, Kleon. Depending on the Misthios' actions, they can convince Deimos to abandon the Cult and rebuild their family with Nikolaos, Myrrine, their sibling, and their new stepbrother Stentor living happily together in their old family home. With war averted and the Cult virtually eliminated, the Misthios heads for the Cult's secret meeting place under the Temple of Delphi to destroy the Precursor pyramid the Cult was using to influence Greek politics. Touching it, they receive visions of future conflicts to come before destroying the pyramid. Aspasia then arrives and reveals that she was the original leader of the Cult but disagreed with its actions as its members became more corrupt, and she thanks the Misthios for destroying the Cult. The Misthios has the option of killing or sparing Aspasia, but cuts ties with her regardless. Finally, the Misthios collects all of the artifacts needed to seal Atlantis, and activates a recording from the Precursor Aletheia who pleads with the Misthios and Layla that Precursor knowledge and technology is not meant for humans and must be destroyed in order for humans to reach their true potential. Pythagoras reluctantly passes the Staff of Hermes on to the Misthios, dying in the process. The Misthios then continues their adventures. In the present, Layla uses the data from the Animus to find Atlantis and activate it. As the Assassins analyze the data within, Layla is shocked to find the Misthios, kept alive until modern times by the Staff of Hermes. The Misthios warns Layla that the world needs a balance between order and chaos, the Templar Order and Assassins respectively, and either side prevailing over the other will result in the world's doom. The Misthios also explains that Layla is the prophesized one who will bring balance to order and chaos and gives her the Staff of Hermes, sacrificing their life in the process. Layla, however, states that there is so much of the Misthios' life they have not seen, and re-enters the Animus. 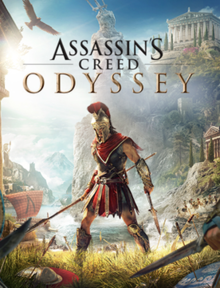 Prior to the game's appearance at E3 2018, Assassin's Creed Odyssey was leaked in May 2018 after the French site Jeuxvideo received a keychain containing the name Assassin's Creed Odyssey on it. Ubisoft announced Assassin's Creed Odyssey and its appearance at the Electronic Entertainment Expo 2018 shortly thereafter. A day before the Ubisoft E3 press conference, screenshots of the game leaked by the gaming website Gematsu. The game was released on October 5, 2018 for Microsoft Windows, PlayStation 4 and Xbox One. A Nintendo Switch version was announced during the Japanese September 2018 Nintendo Direct. Assassin's Creed Odyssey is a cloud-based title on the Nintendo Switch, which launched on the same day as the other platforms, but in Japan only. The game's season pass will include two DLC stories spread across six episodes as well as remastered editions of Assassin's Creed III and Assassin's Creed Liberation. Assassin's Creed Odyssey received "generally favorable" reviews on all platforms, according to review aggregator Metacritic. EGMNow gave the game an 8.5/10, writing "Assassin's Creed Odyssey lives up to its namesake. By fully investing in becoming an action RPG, Odyssey's characters, combat, story, and scope are beyond anything the series has accomplished so far. Its ambitions might get the better of it sometimes, like in how it divides its story moments or in how the leveling system can get out of hand, but the overall experience is, simply put, epic." IGN praised the "world building, environment and engaging gameplay" and summed up its 9.2/10 review with "Assassin's Creed Odyssey's open-world adventure through ancient Greece is a gorgeous thrill, and the best the series has ever been." GamesRadar+ gave it 5 out of 5 stars, praising the characters, opening world and engrossing story, saying that it "perfects everything Origins did and enhances them in ways you never thought an Assassin's Creed game could. Odyssey has it all." Ben "Yahtzee" Croshaw of Zero Punctuation, however, ranked it as the third blandest game of 2018, saying that it "deserves particular mention for being the Assassin's Creed game that finally made me bored of the whole sordid business." Within its first week on sale in Japan, the PlayStation 4 version of Assassin's Creed Odyssey sold 45,166 copies. In the US the first week of sales were pacing better than any other title of the series on the current generation of consoles. Ubisoft said that digital sales of the game was 45% of all sales which is up by 10% over last year’s Assassins Creed Origins. ^ Additional work by Ubisoft Montreal, Ubisoft Bucharest, Ubisoft Singapore, Ubisoft Shanghai, Ubisoft Chengdu, Ubisoft Kiev, Ubisoft Philippines and Sperasoft. ^ Ubisoft Quebec (October 5, 2018). Assassin's Creed Odyssey. Microsoft Windows, PlayStation 4 and Xbox One. Ubisoft. Level/area: Credits. ^ Higham, Michael; Knezevic, Kevin (11 June 2018). "E3 2018: Assassin's Creed Odyssey Has Branching Dialogue Choices". GameSpot. CBS Interactive Inc. Retrieved 12 June 2018. ^ Goroff, Michael (6 June 2018). "Report may reveal Assassin's Creed Odyssey setting, main character". EGMNOW. Retrieved 12 June 2018. ^ a b Philips, Tom (June 11, 2016). "Three hours with Assassin's Creed Odyssey". Eurogamer. Retrieved June 12, 2018. ^ Wright, Steve (12 June 2018). "Assassin's Creed Odyssey skill tree has Warrior, Assassin and Hunter paths". Stevivor. Retrieved 12 June 2018. ^ a b Gartenberg, Chaim (June 11, 2018). "Assassin's Creed: Odyssey is even more of a traditional RPG than last year's Origins". The Verge. Retrieved June 12, 2018. ^ Schwartz, Terri (June 11, 2018). "E3 2018: Why Assassin's Creed Odyssey Is Adding Romance and Character Choice to the Story". IGN. Archived from the original on 2018-06-12. Retrieved June 12, 2018. ^ Totilo, Stephen. "Everything We Learned About Assassin's Creed Odyssey After Playing It". Kotaku. Retrieved June 12, 2018. ^ Alexandra, Heather (15 January 2019). "Assassin's Creed Odyssey's Latest DLC Has A Romantic Ending You Can't Change". Kotaku. Retrieved 16 January 2019. ^ Messner, Steven (16 January 2019). "Assassin's Creed Odyssey's latest DLC forces your hero into a heterosexual romance". PC Gamer. Retrieved 16 January 2019. ^ Phillips, Tom (16 January 2019). "Ubisoft sorry for shock Assassin's Creed Odyssey DLC twist which ignores player choice". Eurogamer. Retrieved 16 January 2019. ^ Arif, Shabana (16 January 2019). "Assassin's Creed Odyssey: Ubisoft Responds to DLC Criticisms Over Player Choice". IGN. Retrieved 16 January 2019. ^ a b Ryan, Jon (June 11, 2018). "E3 2018: Assassin's Creed Odyssey Release Date, Gameplay Details Revealed". IGN. Archived from the original on 2018-06-12. Retrieved June 12, 2018. ^ Fogel, Stefanie (June 11, 2018). "New 'Assassin's Creed Odyssey' Details Drop". Variety. Retrieved June 12, 2018. ^ Dingman, Hayden (5 October 2018). "Assassin's Creed Odyssey review in progress: This ancient adventure breathes new life into the series". PC Gamer. IDG Communications, Inc. Retrieved 11 October 2018. ^ Nedd, Alexis (11 July 2018). "7 ancient Greeks who might be your friend in 'Assassin's Creed: Odyssey'". Mashable. Ziff Davis, LLC. Retrieved 11 October 2018. ^ Campbell, Colin (11 October 2018). "Assassin's Creed Odyssey's best historical characters". Polygon. Retrieved 12 October 2018. ^ Ryan, Jon (16 August 2018). "Assassin's Creed Odyssey: (Re)Building Athens". IGN Entertainment, Inc. Ziff Davis. Retrieved 10 November 2018. ^ Dingman, Hayden (11 October 2018). "Assassin's Creed: Odyssey's hidden Historical Locations map is stuffed with Ancient Greek lore". PC World. IDG Communications, Inc. Retrieved 4 November 2018. ^ Grodt, Jill (3 October 2018). "The Stories Behind Assassin Creed Odyssey's Mythical Locations". Game Informer. Retrieved 4 November 2018. ^ Phillips, Tom. "Assassin's Creed Odyssey has leaked via a keyring". Eurogamer.net. Retrieved June 12, 2018. ^ Kain, Erik. "First 'Assassins Creed Odyssey' Screenshots Leak Ahead Of E3". Forbes. Retrieved June 12, 2018. ^ "Assassin's Creed Odyssey screenshots leaked - Gematsu". Gematsu. June 10, 2018. Archived from the original on June 10, 2018. Retrieved June 12, 2018. ^ McFerran, Damien (September 14, 2018). "Assassin's Creed Odyssey Is Coming To Nintendo Switch, But There's A Catch". Nintendo Life. Retrieved September 14, 2018. ^ Knoop, Joseph (June 11, 2018). "Assassin's Creed Odyssey Special editions announced". IGN. Retrieved September 17, 2018. ^ Wallace, Jamie (June 12, 2018). "has upwards of four special editions". Eurogamer. Retrieved September 17, 2018. ^ a b "Assassin's Creed Odyssey for PC Reviews". Metacritic. Retrieved March 23, 2019. ^ a b "Assassin's Creed Odyssey for PlayStation 4 Reviews". Metacritic. Retrieved March 23, 2019. ^ a b "Assassin's Creed Odyssey for Xbox One Reviews". Metacritic. Retrieved March 23, 2019. ^ a b Goroff, Michael (October 1, 2018). "Assassin's Creed Odyssey Review". EGMNow. Retrieved October 1, 2018. ^ Juba, Joe (October 1, 2018). "Assassin's Creed Odyssey – Fighting For Glory – PlayStation 4". Game Informer. Retrieved October 1, 2018. ^ Fillari, Alessandro (October 1, 2018). "Assassin's Creed Odyssey Review - A Mighty Adventure". GameSpot. Retrieved October 1, 2018. ^ a b Loveridge, Sam (October 1, 2018). "Assassin's Creed Odyssey review: "No-one's made an open-world RPG with this much depth and brilliance since The Witcher 3"". GamesRadar+. Retrieved October 1, 2018. ^ a b Tyrrel, Brandin (October 1, 2018). "Assassin's Creed Odyssey Review". IGN. Retrieved October 1, 2018. ^ Williams, Mike (October 1, 2018). "Assassin's Creed Odyssey review". USGamer. Retrieved October 1, 2018. ^ Romano, Sal (October 10, 2018). "Media Create Sales: 10/1/18 – 10/7/18". Gematsu. Retrieved November 3, 2018. ^ Watts, Steve (July 2, 2018). "Resident Evil 2 Wins Top Honor In E3 Game Critics Awards". GameSpot. Retrieved November 15, 2018. ^ Keane, Sean (August 22, 2018). "Gamescom 2018 award winners include Marvel's Spider-Man, Super Smash Bros. Ultimate". CNET. Retrieved November 15, 2018. ^ Andronico, Michael (October 26, 2018). "Golden Joystick Awards: Vote for Ultimate Game of the Year". Tom's Guide. Retrieved November 15, 2018. ^ McWhertor, Michael (November 13, 2018). "The Game Awards 2018 nominees led by God of War, Red Dead Redemption 2". Polygon. Retrieved November 15, 2018. ^ Makuch, Eddie (January 10, 2019). "God Of War, Spider-Man Lead DICE Awards; Here's All The Nominees". GameSpot. Retrieved January 11, 2019. ^ Good, Owen S. (January 4, 2019). "Red Dead Redemption 2 tops list of Game Developers Choice nominees". Polygon. Retrieved January 7, 2019. ^ Milligan, Mercedes (January 25, 2019). "GLAAD Media Awards: 'Adventure Time,' 'She-Ra,' 'Steven Universe' Nominated". Animation Magazine. ^ Fogel, Stefanie (March 14, 2019). "'God of War,' 'Red Dead 2' Lead BAFTA Game Awards Nominations". Variety. Retrieved March 14, 2019. Wikimedia Commons has media related to Assassin's Creed Odyssey. Wikivoyage has a travel guide for Assassin's Creed Odyssey.